Mortal Alexandra Jennings has embraced her education at Akarnae and continues her indoctrination in order to protect the Medoran society against Aven Dalmarta, the fallen prince of the City of Meya when a fallen Draekon is discovered, captured and awaiting death. 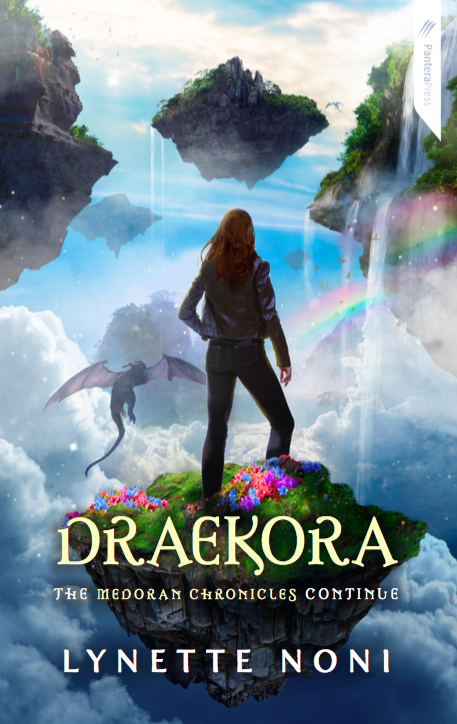 Journeying to a world of infinite discovery, Alexandra has regressed to the former glory of the City of Meya where the Draekon saturate the skies. With juvenile Draekon Xiraxus as her guide, Alexandra cannot yet return to the Akarnae Academy and is placed with the Dalmarta princes under the guise of being a lost child of the empire. Draekora is the third fantastical installment of The Medoran Chronicles. Alexandra Jennings is an adventurous, enchanting character and her journey a compelling narration. As Alexandra continues to prepare for the impending confrontation her main concern is for Jordan, captured under Aven's influence. Alexander is wonderfully human, immersed within a world of immortal beings and transported to a bygone illustrious City of Meya, concealed as a lost Meyarin daughter. Roka and Aven Dalmarta are assigned to assist Alexandra, her humanity unbeknownst to both Dalmarta Princes. Roka is disciplined and gentle leader and accepting of the Meyarin trade with the human population who reside beyond the boundaries of Meya, whilst Aven opposes. Aven's distaste for mortals evolves as he and Alexandra begin to develop a tentative friendship. Aven is a warm and compassionate young man, albeit ignorant and consumed with abolishing transactions with human merchants and incites a revolution evoked within the darkened streets of Meya. Aven is a delectable character, nefarious but not without redemption and I'm entirely infatuated. Xiraxus is a wonderful addition to the The Medoran Chronicles. The Draekon heir shares a familial alliance with Alexandra, assisting her in navigating the City of Meya. The Meyarin chronicles were captivating and I appreciated Kyia and Zain's inception. Aven's trusted warrior Niyx was delightfully surprising and an ingenious inclusion. Alexandra's parents are still noticeably absent, assumingly discovering the artifacts of the Akarnae Academy as are friends Bear, Jordan, D.C and Kaiden, Alexandra's potential love interest although a constant within her thoughts. Author Lynette Noni had crafted a breathtaking ambiance that introduces wonderous worlds in an exceptional and enchanting infusion of fantasy and adventure. It's impossible not to enjoy it though Lauren. Before I begun Akarnae I assumed the series would have been a little young for me but it's so thoroughly entertaining. I would place the series on par with the magic of Harry Potter. It was my favourite so far but not just for the Draekon, but Aven. He's been one of my favourite villains in young adult so far. dragons, the ultimate reason to read a book! Dragons and a delicious villain Ailyn. Move it up that to read list, you'll most definitely be thankful. I’ve got this lovely sitting on myself and I am dying to read it, even more so now! Thanks Kelly :-P :-) now the stack I must read first is taunting me. I loved Kaiden in the first two books (who am I kidding I loved Alexandra and most of her classmates), but it sounds like I’ll have to wait for the fourth book for Alexandra’s and Kaiden's chemistry to show its adorable self again. You’ve made this third instalment sound fantastic, so I’m sure the little girl inside me will fully satisfied. I love Kaiden's character too! Although he doesn't have a role in Draekora, he's still in Alex's thoughts. I loved Aven's origins, he's truly one of the most well written villains in young adult. Oh no no Karen, The Medoran Chronicles is absolutely delightful! It's such an amazing series. I can almost guarantee you'll adore it. Omg I definitely need to read these books. Don't know how I've gone so long without reading them!! AND THE COVERS AHHH. You need these books in your life. The delicious villain, the otherworldly school for gifted children, immortals and dragons. Ooh it's not easy to write a good dragon book, but it seems like Lynette has really hit the nail on the head with this series. I haven't picked this series up before, so got a little confused with all the character names haha, but so glad to hear you enjoyed it! It's honestly the first dragon themed young adult book that I've fallen head over heels for Joy. Like mermaid books, they're impossibly to find a decent one but this has really set the bar high. Hm, such a lovely cover! Not sure if this is my cup of tea, but those dragons? Are so tempting! I honestly believe the series appeals to such a wider audience, especially those who have enjoyed Harry Potter or Percy Jackson. And the dragons are such a brilliant addition. It's #LoveOzYA as well which is always a winner. I'd love to see what you think of it Verushka. This sounds very interesting!! I don't know if I'll try it or not, but it's good to know about!! Also, I am kind of in love with that cover. Wonderful review!! Thanks Lenna. It's a wonderfully entertaining series and I'd love to see what you think of it.